Castlevania is one of the most storied franchises in all of gaming. Renowned for its intricate action and grim atmosphere, the sidescrolling series would eventually reach new heights when it combined Metroid-style exploration and RPG elements into the mix with the classic, Castlevania: Symphony of the Night. But before Symphony helped create the “Metroidvania” sub-genre, Castlevania’s most acclaimed entry was Super Castlevania IV on the Super NES, which many still hail as the best “traditional” Castlevania to date. In many ways, Super Castlevania IV lives up to the legacy its built in all these years since its original release. But in some areas, the game shows a bit of age. 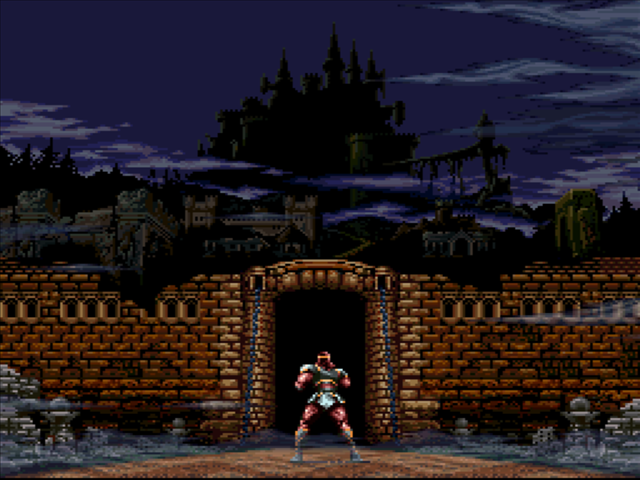 Storywise, the game is a remake of the original Castlevania, with Simon Belmont venturing to defeat the evil count Dracula, after the vampire lord has resurrected from a previous defeat 100 years prior. But other then the simple plot, the game is entirely original from the previous games in the series, with new levels and gameplay mechanics that built on its predecessors and brought the series up to date for the 16-bit era. The game takes place over eleven stages, and like any old school action game, the goal is to simply make it to the end of a stage and defeat its boss to progress further. Simon Belmont is equipped with a whip that can lash out in eight directions. The whip can also be used to swing across chasms in various points in the game. It can even be swung to shield Simon from projectiles. Additionally, secondary items such as throwing axes and boomerang-like crucifixes can be found throughout the stages, and require ‘hearts’ (think Magic Points with the collectibility of Mario’s coins) in order to be used. The combat is undoubtedly the best aspect of the gameplay, as whipping down hordes of monsters becomes a thrilling experience. Unfortunately, there are some areas in gameplay that haven’t aged particularly well. The most notable of which being the jumping, which feels both slow and stiff. Granted, Castlevania is based more on action than platforming, but theres enough jumping from one object to the next to make the clunky jumping become a major problem at some points in the game. Another problem – strange as this may sound – comes from walking up and down stairs. When Simon sets one foot on the first step of a staircase, he becomes “glued” to the steps, unable to jump, which leaves him vulnerable to enemy attacks. The sense of control when Simon is walking on a staircase just feels awkward. The extensive knockback that Simon receives from enemies also becomes a bit of a problem, and you may get more game overs from Simon being knocked back into a pit than from losing all your health. 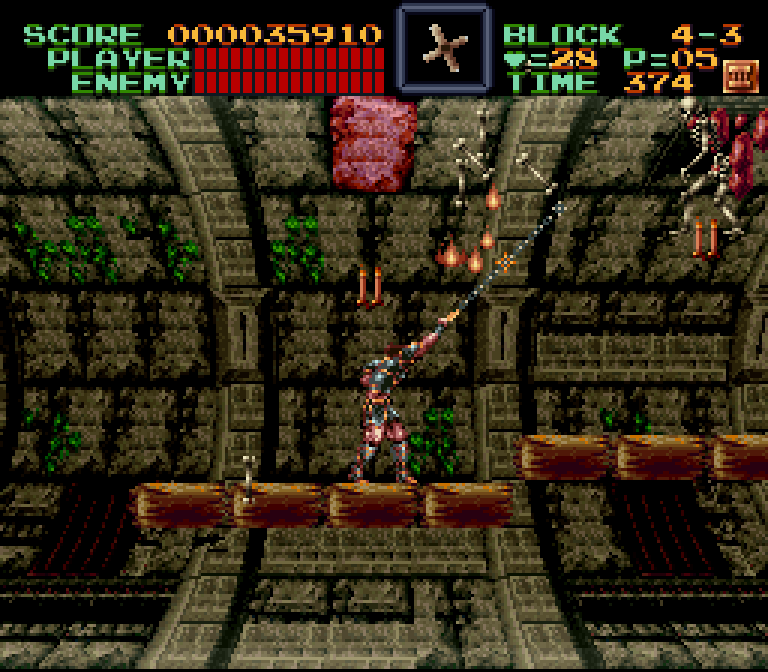 Notably, vertical-based segments become a particular pain, since previous platforms disappear once they fall out of the screen’s focus, so one hit from an enemy often sends Simon plummeting to his doom. The game as a whole can get pretty difficult. At the best of times this is due to the game’s wonderful level design (with every level feeling distinct from one another), and at its worst due to the aforementioned stiff mechanics. There are some segments that should be reasonably difficult, but they are often made downright frustrating by the awkward control. While the controls often damper the experience, the adventure as a whole is still memorable, and more than worth a look for fans of classic action games. 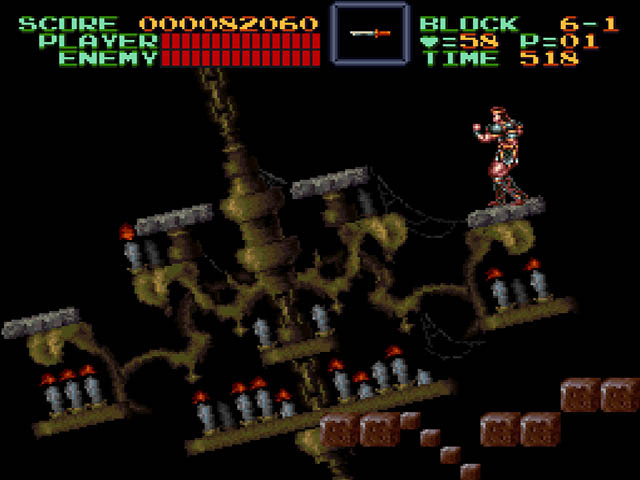 The level designs are creative, sometimes even genius, as the game took advantage of the SNES’ capabilities of scaling and rotation in inventive ways. The game still looks great, and sounds even better. The character designs are detailed, and the graphics are appropriately gloomy, with even the title screen setting up its dreary atmosphere. 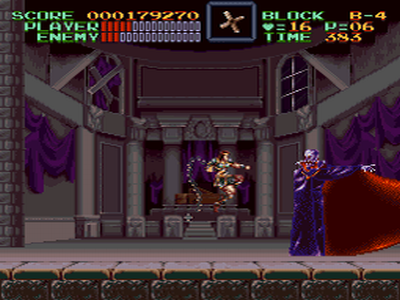 The soundtrack is a highlight in both the Castlevania series and the SNES library, which is no small feat, considering the hefty soundtracks to be found in both categories. There’s certainly a lot to love about Super Castlevania IV: Its hard to imagine its presentation could get any better for its time, the combat is fun, the boss fights are memorable in a “difficult but fair” kind of way, and the level design is a constant delight. The downside is that as great as the overall game is, Simon’s slow and often awkward sense of control can hinder the fun. The overall package is something to behold, but Simon himself seems to have aged in the years since the game’s initial release. Super Castlevania IV is an epic, eerie quest. But it lacks the timelessness and seemingly perfect execution of design that Symphony of the Night boasts. A classic for its time that’s deserving of a revisit, if maybe not a timeless classic in its own right. Please do reviews of the first 3 games and Bloodlines! Oh, and Rondo of Blood too please. If you haven’t played Rondo of Blood…you are missing out. Especially when it comes to the soundtrack because it’s the best in the series IMO. I’ll try to get around to all of them when I can. I can’t make any guarantee when I’ll do them, but I’ll try not to make it too long of a wait. Thanks for reading! And feel free to suggest any games for me to look into and review (though again, I can’t always guarantee what or when I’ll be able to review something…hence the headline at the top of the homepage).